The time may have finally arrived. 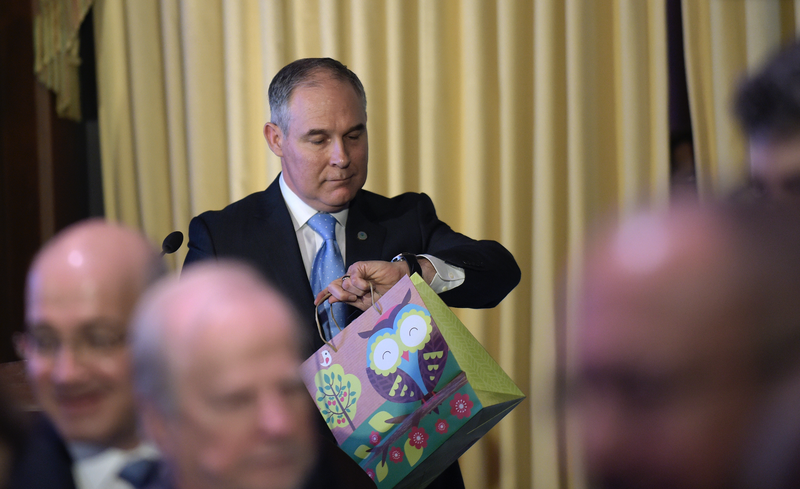 Pruitt’s comments may violate EPA “scientific integrity” policy which requires that the agency respects the consensus of the broader scientific community, rather than dismissing it. The EPA Inspector General’s office responded to the Sierra Club on Thursday in an email, saying it had referred the matter to the EPA’s Scientific Integrity Officer, Francesca Grifo, for review. “If after the SIO review, she concludes there is some aspect of the letter itself, or her findings or conclusions that she believes are appropriate for further consideration by the OIG [Office of Inspector General], she will so notify the OIG,” the email stated. Humans are already seeing the effects of global warming, so it’s hard to imagine what could be less respectful to the scientific community than to dismiss copious peer-reviewed research on climate change and act as if this is a matter of debate or opinion. We’re not discussing which drapes would match the decor of a living room. We’re talking about the greatest environmental threat of our time. There’s no word on how long the investigation will last, but, if nothing else, maybe Pruitt will think twice (maybe even a third time?) before casually spouting insanity.